10 x € 117.60 / mėn. ? 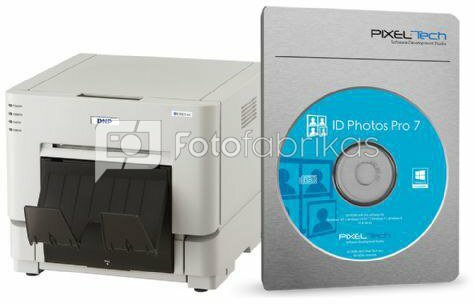 The IdPhotos Pro and DNP DS-RX1 Printer is the perfect combination to print ID photographs. Idphotos Pro ™ is an advanced, yet easy-to-use software tool designed for the automatic imaging process of ID photos. Through this imaging process, the software ensures that the specific national and international requirements and regulations are met. 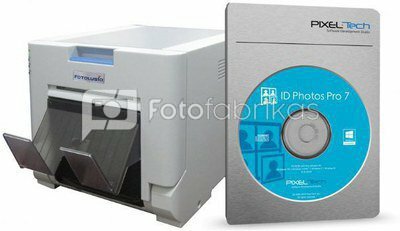 The DNP DS-RX1 Digital Dye Sublimation Photo Printer is ideal for printing large quantities of professional quality photos in a timely and cost effective manner. The DS-RX1 has a maximum resolution of 600dpi and the capacity to print up to 700 prints per roll. The DS-RX1 gives you the ability to finish your prints with either a glossy or matte finish. This setting can be changed on the printer without having to switch the paper. The printer also has the ability to cut a 10 x 15cm print in half, providing you with two 5 x 15cm prints. The price for a single print starts from € 0.096.